Elvis is the "King of Rock 'n' Roll" and a grandpa again! 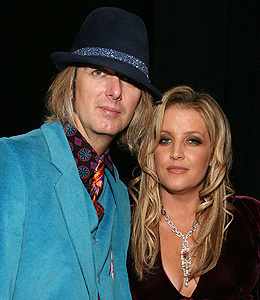 Lisa Marie Presley and husband number 4 Michael Lockwood welcomed two baby girls by c-section Tuesday afternoon. The girls weighed 5 lbs 15 oz and 5 lbs 2 oz. Presley's rep released a statement today saying, "The babies and mom are happy and healthy and resting at home." Lisa Marie is also the mother of Danielle Riley and Benjamin Storm. Father is ex-hubby musician/actor Danny Keough.